Don't get left out in the cold! A little maintenance and attention now can keep your furnace chugging away all winter long. Don’t wait until temperatures plummet: Now is the absolute best time to perform basic furnace cleaning and maintenance. By tuning up your heating appliance, you can save the time and money that might have had to go into addressing a crisis—and of course, you can avoid the inconvenience (and downright danger) of leaving your family without heat during the coldest part of the year. Also, by performing these very basic furnace cleaning and maintenance tasks, you can actually prolong the life of your furnace and coax it into operating at maximum energy efficiency. Follow these steps now to keep the unit in tip-top shape through the winter. Before doing anything else, cut both the electrical power and fuel supply to the furnace. Accomplish the former by toggling the on-off switch on the unit itself. To do the latter, first find the fuel shutoff valve. (Depending on your fuel source—oil or gas—the valve should either be near the oil tank or on the incoming gas pipe.) Next, remove the door to the combustion chamber and proceed to vacuum the interior. Inspect the chamber for holes created by corrosion. If you find any, be sure to cover them with foil tape. Lift off the door to the blower compartment and thoroughly vacuum inside. As you did in the combustion chamber, look here—and in the exhaust flue—for holes. Cover any holes with foil tape before replacing the door. Perform the same inspection on all ductwork, including the return air ducts, patching if necessary. Basic furnace filters are designed to trap dust, dirt, and airborne particulates before they can enter the furnace and potentially damage its components. During heating season, clean or replace the furnace filter every one to three months (some filters can be cleaned, while others can’t). Note that because today’s homes are so tightly sealed, most indoor air circulates through the HVAC system. For that reason, it’s generally worthwhile to spend a bit more on a furnace filter that not only protects the appliance itself, but also enhances air quality by trapping bacteria and pollen as well as mildew and mold spores. If yours is an oil-fired furnace, remember to replace the oil filter as well as the air filter; the oil filter should be replaced annually. Many older furnaces have two motor bearings and two blower-shaft bearings. Both sets need to be oiled at least once per year. Start by using a clean cloth to wipe the caps over the bearings. Next, remove the caps and apply two or three drops of lightweight machine oil to each bearing,being careful not to over lubricate. Finish by restoring the caps to their original positions. Although basic furnace maintenance can be handled by most homeowners, there are some instances in which it only makes sense to hire a professional—for instance, if you’ve noticed the furnace rumbling and can’t figure out why. Any of the below situations usually call for a consultation with a HVAC pro. • Excessive soot: If in the course of cleaning the combustion chamber you notice that an excessive amount of soot has accumulated, that indicates that the burners need adjustment or that the heat exchanger must be replaced. Call in a pro to diagnose and fix the problem. • Irregular flame: The pilot light flame should be blue, not yellow. If yours is faint or irregular, it can be a sign of dirty burners or a cracked heat exchanger. Again, hire a pro to diagnose and fix the problem. The hazards involved make such work ill-advised for do-it-yourselfers. 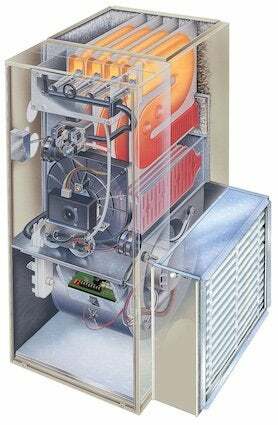 • Short cycling: Is your furnace running for a short period of time only to shut off suddenly? That’s known as “short cycling” and may be caused by an out-of-whack thermostat or an overheating exchanger. Retain the services of a pro to investigate and solve the problem.